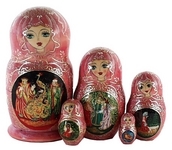 There are 5 figures of similar dolls in the Russian Nesting Dolls - Fairytale Potpourri set. 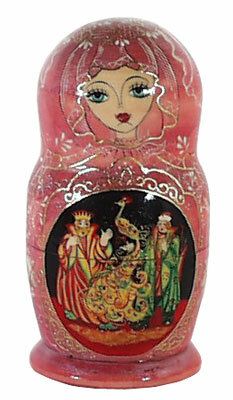 On every doll sceneries from the popular Russian Fairytales: "The Firebird" ("The Zhar-Ptitsa"), "Alyonushka", "The tale of the Golden Fish", "Wee Little Havroshechka". Very rich and bright paints including gold are used. All the drawings of this item are made by the real artist so delicate and subtle, that as a whole the doll is just breathtaking! The tallest one is 6 ", the smallest - 1 1/4".